At Hannon Hill, we love participating in events connecting higher education professionals with resources that positively augment communication efforts. 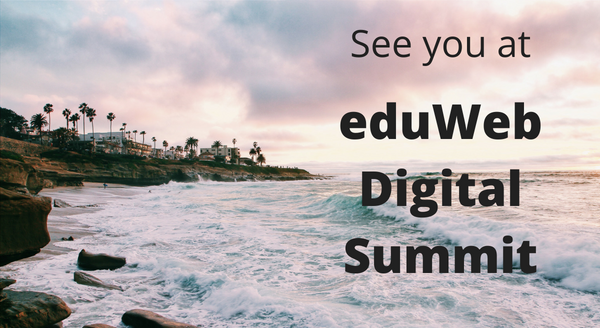 This year, we are traveling to sunny San Diego to attend the annual eduWeb Digital Summit. The eduWeb Digital Summit is a yearly gathering of like-minded individuals motivated towards the “integration of mobile, social media, branding, and communication content with programming, design, and analytics". With a series of workshops and presentations, it’s an opportunity to participate in an exchange of ideas surrounding current challenges and advances within the industry. From Monday, July 23 thru Wednesday, July 25, come visit Hannon Hill at our booth to learn more about how we can help your organization improve its digital presence through thoughtful and purposeful content promotion. Chat with us, pick up some free swag, and enter to win our summer fun giveaways! If you'll be in San Diego, we look forward to connecting with you there!